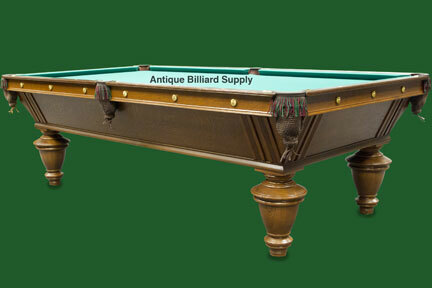 #2-03 The design of this antique pool table brought Brunswick a gold medal at the Paris Exposition. Constructed of quarter-sawn oak, the heavy body and sturdy legs assure positive rigidity and minimize the need for releveling. Three-piece slate playing surface. Nine-foot size shown. Ready for delivery.